Internet of things (IoT) technology is anticipated to play a significant role in increasing the current agricultural productivity to cater to the growing demand for food. IoT in agriculture industry incorporates IoT-based advanced technological tools, systems, equipment, and solutions to enhance the operational efficiency, maximize yield, and minimize wastage of energy through real-time field data collection, data storage, data analysis, and development of control platform. Diverse IoT-based applications such as precision farming, livestock monitoring, smart greenhouse, and fish farm monitoring, are expected to be instrumental in increasing the speed of the agriculture processes. IoT technology can address agriculture-based issues and optimize the quantity and quality of agriculture production, by connecting farms through a single platform and making them more intelligent by sharing, storing, and analyzing the information. 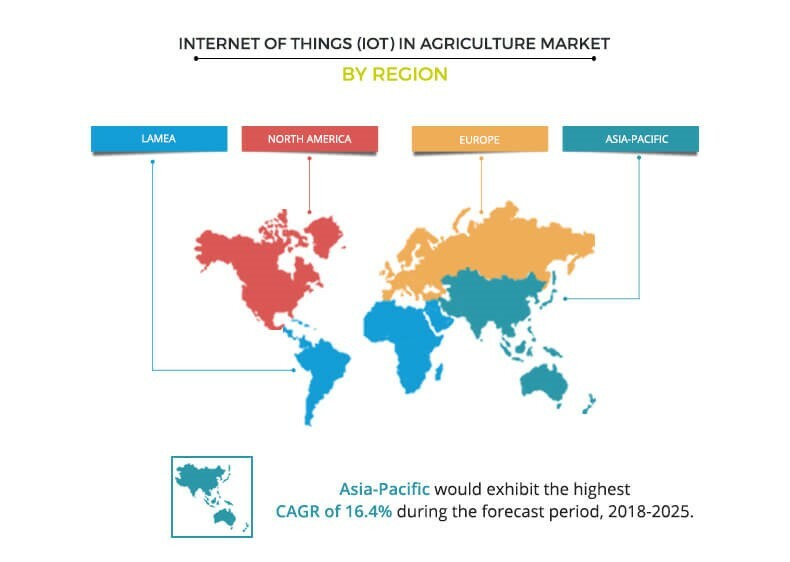 The Global Iot In Agriculture Market is estimated to grow at a notable CAGR of 14.7% from 2018 to 2025, due to lowered cost of technology as a result of ongoing R&D in IoT, and efforts by various governments of the countries across the globe to increase the quality and quantity of agriculture production. 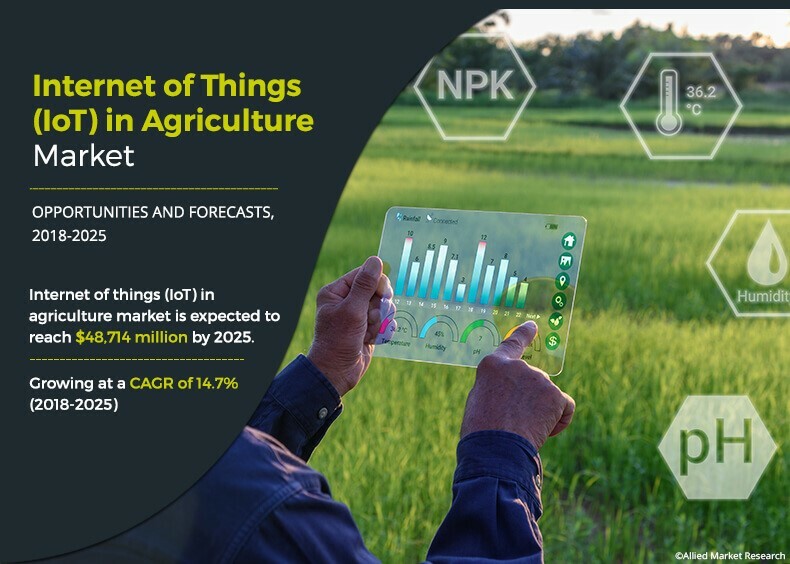 Factors such as rise in global population and increase in demand for food across the globe have fueled the adoption of new technology to optimize the agriculture production, are expected to boost the growth of the IoT in agriculture market. In addition, climate change plays a significant role in impacting the global agriculture production. Thus, severe weather condition supports the deployment of IoT-based technology to optimize agriculture production. However, the agriculture industry comprises of numerous small players that provide solutions for various stages of the agriculture value chain. As a few of the agricultural processes achieve economic feasibility, growth of the market is expected to be hampered during the forecast period. Nevertheless, increase in smartphone users and internet penetration among farmers boosts their awareness about the latest developments in the agriculture market, which is anticipated to drive the market growth. The global IoT in agriculture market is segmented based on system, application, and region. 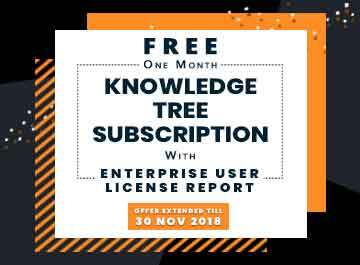 Based on system, it is classified into automation and control systems, sensing and monitoring devices, livestock monitoring hardware, fish farming hardware, smart greenhouse hardware, and software. Based on application, it is divided into precision farming, livestock monitoring, smart greenhouse, and fish farm monitoring. Based on region, the market is analyzed across North America (U.S., Canada, and Mexico), Europe (Sweden, Finland, Germany, The Netherlands, and rest of Europe), Asia-Pacific (China, Japan, India, Australia, South Korea, and rest of Asia-Pacific), and LAMEA (Brazil, KSA, South Africa, and rest of LAMEA). Based on system, the market is categorized into automation and control systems, sensing and monitoring devices, livestock monitoring hardware, fish farming hardware, smart greenhouse hardware, and software. In 2017, software was the leading segment in the global market, as it consists of numerous tools to control hardware such as yield monitors, soil sensors, water sensors, climate sensors that are used in wide range of precision farming, smart greenhouse farming, and fish farming applications. The precision farming segment dominates IoT in agriculture market in 2017, accounting for around 44.7% of the overall market revenue. Precision farming enables IoT, information technology, and communication to revolutionize the global agriculture sector, by optimizing its production and efficiency. Livestock monitoring and integration of IoT system technology for detection of livestock location and health are expected to grow significantly during the forecast period. In 2017, the precision farming segment used IoT for field application as well as in farm equipment to collect data that can be analyzed and used to optimize production and save energy is projected to lead the market during the forecast period. The livestock monitoring segment, which includes global positioning system (GPS), and sensors is anticipated to be the fastest growing segment. IoT in livestock helps growers to monitor livestock health by detecting illness and taking the preventive measure is anticipated to drive the market growth during forecast period. By region, Asia-Pacific was the largest market for IoT in agriculture in 2017 owing to rise in population coupled with increased demand for food in the region. In addition, government initiative to use remote sensing technology to collect ground data information and satellite image to detect agriculture condition in various region is expected to further boost the market growth. 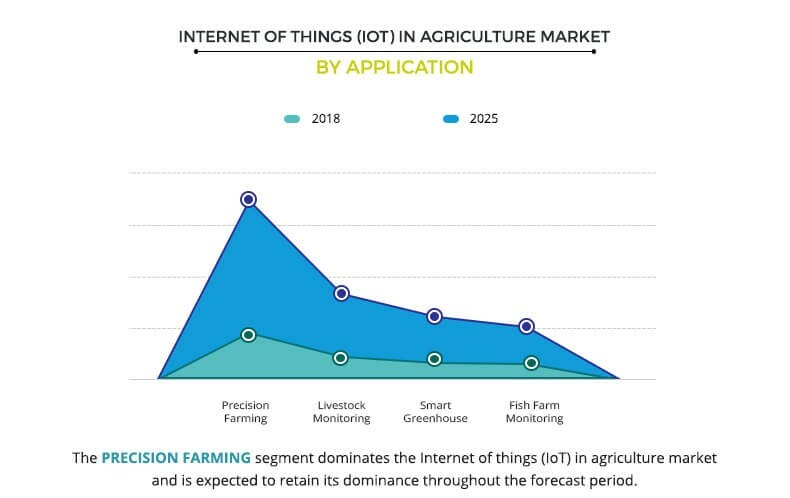 The top market players in the global IoT in agriculture market include Cisco Systems, Inc., International Business Management Corporation (IBM), Telit, Hitachi, Ltd, Decisive Farming, Trimble Inc., OnFarm Systems Inc., Farmers Edge Inc., SlantRange, Inc., and The Climate Corporation. This report provides a quantitative analysis of the current trends, estimations, and dynamics of the global IoT in agriculture market size from 2018 to 2025 to identify the prevailing market opportunities. A comprehensive analysis of factors that drive and restrict the growth of the IoT in agriculture market is provided. An in-depth analysis of the global IoT in agriculture market helps determine the prevailing market opportunities. 6.10. Trellis Earth Products, Inc.
6.12. LyondellBasell Industries Holdings B.V.
Internet of things (IoT) ecosystem in agriculture has been helping farmers and growers to increase production and reduce wastage of energy. However, digital agriculture is expected to be defined by IoT in future. In coming years, intelligence is expected to be embedded into the operation and design of every device and machine, connecting real-time farming processes with data input from sources as diverse as weather stations, soil, water quality and consumers. This enables the farmer to make more informed decisions. Analytic tools and software such as complex event processing (CEP), help process and analyze data on a real-time basis, which drives timely decision making and action. According to a recent study, food and agribusiness have a massive social, economic, and environmental footprint and represent 10% of the global consumer expenditure. Although productivity improvements in the past have enabled an increase in food supply in many parts of the globe, feeding the global population has reemerged as a critical issue. A report by the United Nation, the world population is expected to increase from 7,630 million in 2018 to 9,772 million by 2050. Accordingly, crop demand, human consumption, and animal feed stock demand are expected to increase by two-folds. Also, in coming years, various emerging constraints such as labor shortage, and water scarcity are expected to impact the agriculture production. In addition, more than 20% of arable land is estimated to be degraded by various sources of erosion such as water erosion, and soil erosion. Such scarcity of important resources will hamper agriculture production. 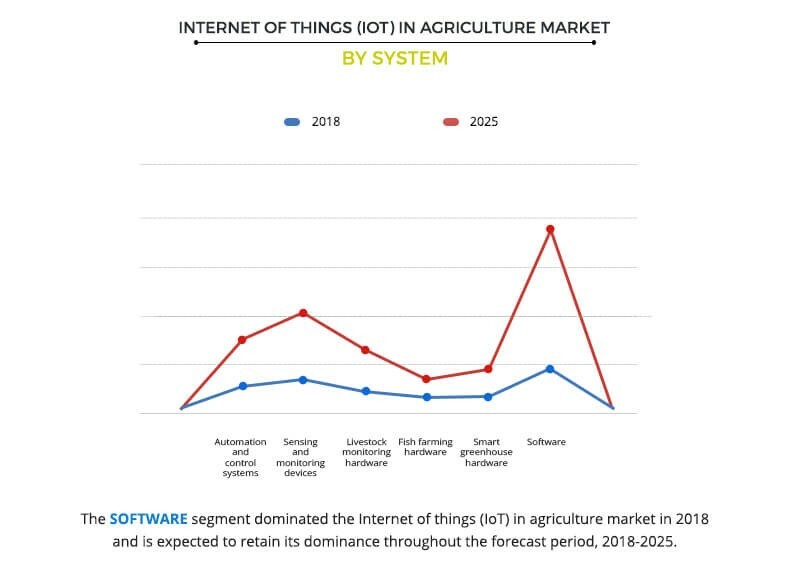 Thus, development of IoT in the agriculture industry is projected to increase productivity in various region such as Africa, Eastern Europe, South America, and Asia. However, finding a good investment opportunity is not an easy task as it requires deep understanding of crops, geographies, food supply chain, and IoT technology development in the agriculture industry.